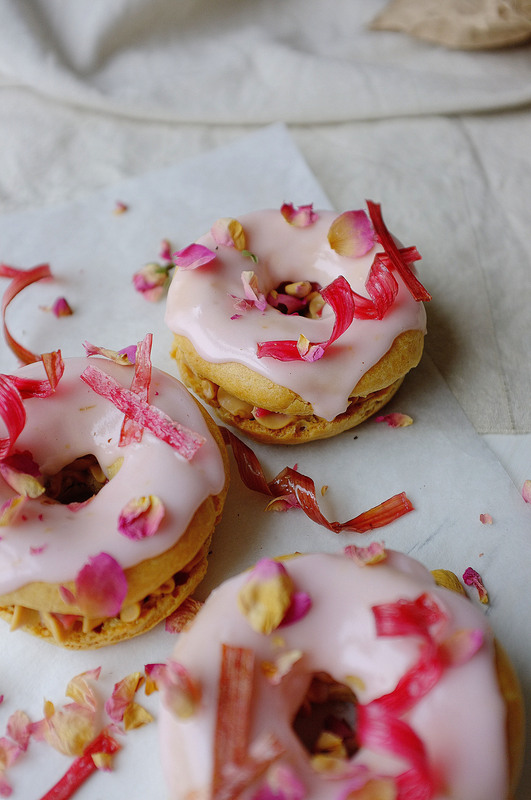 Crisp choux pastry, sharp roast rhubarb with a hint of vanilla, and butterscotch-sweet caramelised white chocolate cream; a delicious combination you’ve got to try, and a great way to celebrate seasonal British produce (and millennial pink… *sigh*). To make the choux put the water, butter and salt in a saucepan set over a medium heat (do not let it boil at this stage). Meanwhile, sieve the flour to remove any lumps. When the butter has melted into the water, increase the heat and bring to a rolling boil, then tip in the flour and stir vigorously until you have a smooth paste-like mix which comes away from the edges of the pan. Continue to stir for another minute to cook out the rawness of the flour, then tip into a clean bowl and close cover with cling film (this eggless stage is known as a ‘panade’). Leave to cool to room temperature. Preheat the oven to 190c. Line 2 large baking trays with greaseproof paper. Once the panade has cooled it’s time to add the eggs; whisk in a jug to break them up then very gradually add into the panade while beating with electric beaters. Stop adding the egg (you might have a little leftover) when the smooth, lump-free mixture reluctantly drops off the end of a spoon. Pile the choux mix into a piping bag, fitted with a large round nozzle. Pipe 10-12 doughnut shapes onto the prepared baking trays, leaving room for expansion. Bake the choux for 20-25 minutes or until crisp and golden, then skewer each one and return to the oven for around 10 minutes or until the middles have completely dried out. Set aside to cool and reduce the oven temperature to 180c. 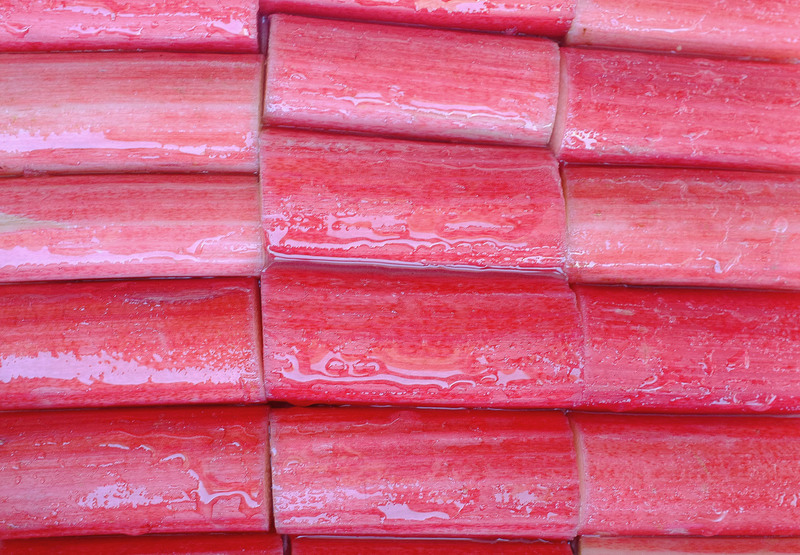 Slice the rhubarb into batons and toss in the caster sugar, lemon juice and zest and vanilla. Roast for 10-15 minutes in a high sided baking tray until the pieces are tender but still retain their shape. Set aside to cool and reduce the oven temperature to 120c. Chop up the white chocolate and scatter on a lined baking tray in an even layer. Place in the oven to allow the chocolate to melt for 10 minutes, then stir/turn and return to the oven for another 10 minutes. Repeat this step 2-3 more times until the chocolate reaches a deep golden colour, then scrape into a bowl and mix in a splash of cream to loosen the consistency (it can get a little grainy at this stage so pass through a sieve if necessary). Leave to cool. Once the white chocolate has cooled, place in a bowl (or bowl of a stand mixer with whisk attachment) and add in the cream and salt. Whisk until pipe-able. Slice the cooled choux nuts in half horizontally and pipe in a generous helping of caramelised white chocolate cream. Slice the roast rhubarb pieces thinly and arrange these on top of the cream, then pop the choux lid on top. For the pink icing, pour the cooking syrup from the rhubarb tray into the icing sugar and mix to create a smooth drizzle-like consistency (add in a little water if you don’t have enough syrup). 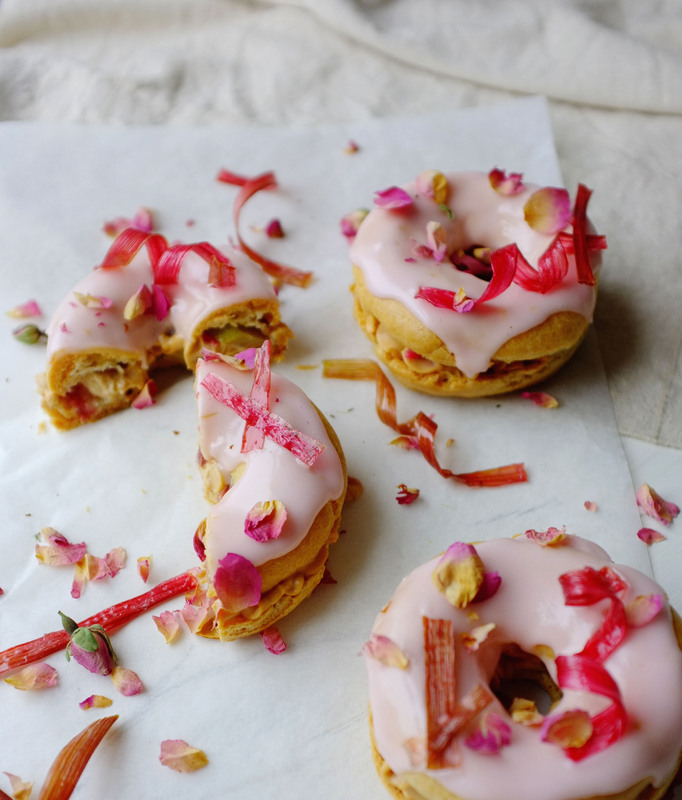 Spoon this over the filled choux-nuts and garnish with edible petals and rhubarb ribbons. 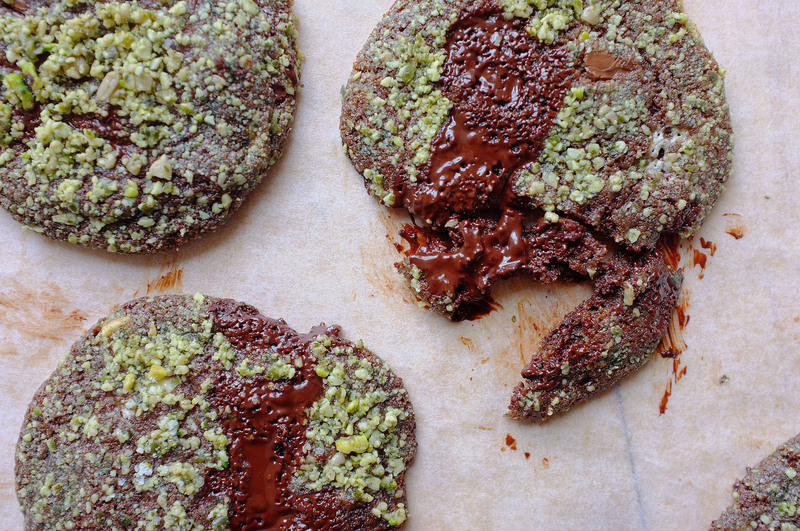 Soft, chewy, chocolate and rye cookie dough, molten chocolate chunks and nutty pockets of crumbled halva; all encased in a sea salt and pistachio crackle coating. Gently melt the butter in a saucepan then tip into a large mixing bowl (or bowl of a stand mixer). Allow it to cool for a few minutes then add in both sugars and a pinch of salt. Cream together until light and fluffy. Once creamed, add in the eggs and egg yolk one at a time, beating well between each addition. In a separate bowl, stir together both flours, bicarbonate of soda, baking powder and cocoa powder. Add these dry ingredients into the wet, beating only until just combined (do not over mix). Now, using a wooden spoon, stir in the halva and all the chopped chocolate. Close cover with cling film and chill for at least 2 hours. Preheat the oven to 180c. Line 2 large trays with baking paper (you will need to bake the cookies in batches). Tip the chopped pistachios into a large bowl and add a generous pinch of sea salt. Stir. 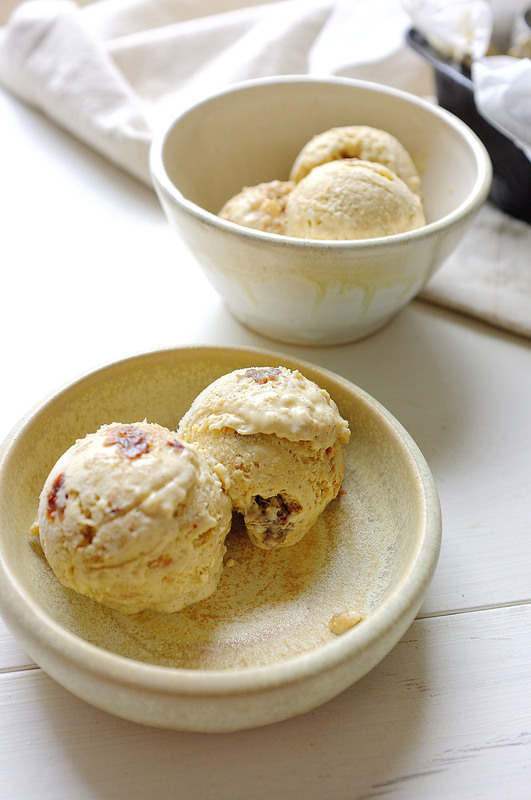 Take your chilled cookie dough and create equal balls using an ice cream scoop. 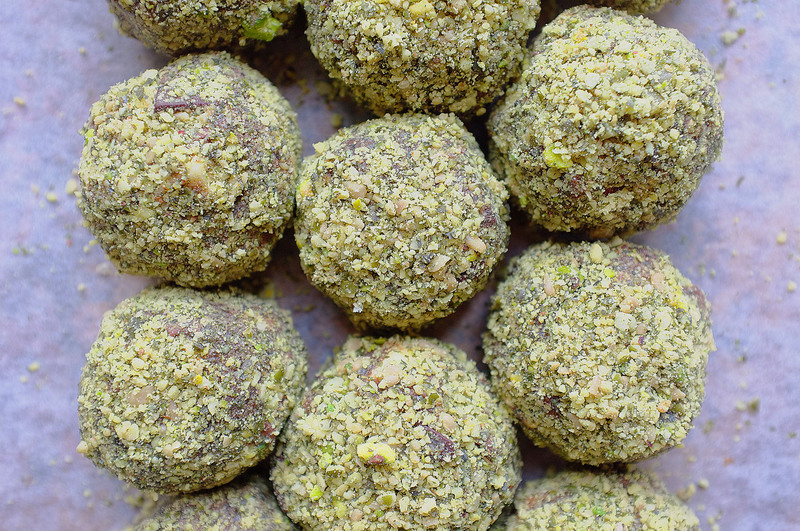 Roll each ball of dough in the pistachio crumb, then arrange on the baking trays (I usually bake about 4 per tray to allow for spreading). Bake each batch for 10 minutes, then remove from the oven, sharply tap the tray on a flat work surface and return to the oven for 2-3 minutes. Repeat the tap step once more and bake for a further 2-3 minutes, or until the cookies are crisping up at the edges but still very soft in the middle. Once baked, leave to firm up a little on the baking trays, then serve. I made this cake last weekend for my Dad’s birthday and it went down a storm. Granted, the flavours aren’t subtle and it’s not for the faint hearted (which neatly mirrors my Dad’s personality actually), but the punchy combination of bitter coffee, nutty hazelnut, rich but surprisingly light chocolate sponge and salted milk chocolate ganache just work (duh- that amount of cream, sugar, salt and chocolate is always going to be delicious). 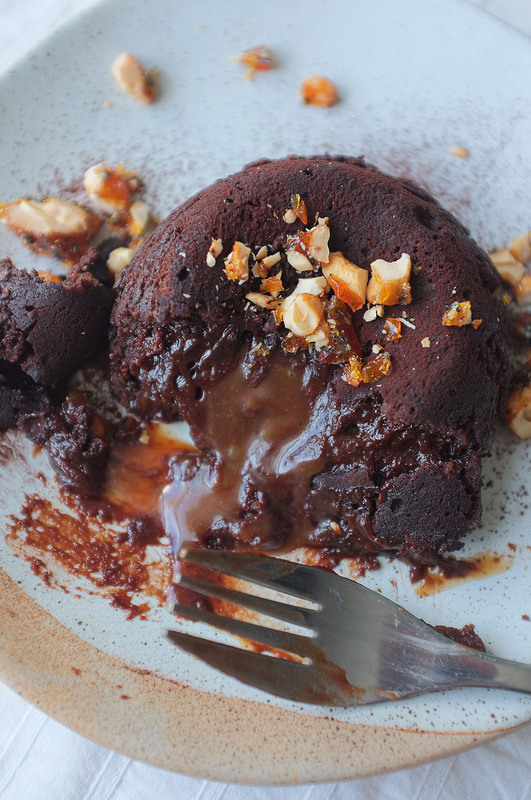 Start off by making the hazelnut praline caramel.To do this simply place the caster sugar in a heavy bottom pan over a medium heat and swirl the pan until it melts. Once melted, up the heat until the sugar reaches a deep golden brown. At this stage add the toasted hazelnuts, stir to coat then tip onto a baking paper lined baking tray. Leave to set hard, then blitz into a paste. Set aside. Pour the cream into a saucepan and gently heat. Once the cream is gently simmering add in the praline paste and stir to create a caramel. Cook down for a few minutes until thickened, then set aside to cool. Preheat the oven to 170c. Grease and line two 8 inch baking tins. Melt the dark chocolate in a heatproof bowl set over a pan of simmering water (or in the microwave in short stints, stirring often). Set aside. In a large bowl stir together the flour, caster sugar, cocoa powder, baking powder, bicarbonate of soda and salt. In a jug, lightly whisk the eggs, milk, vegetable oil and vanilla extract. Make a well in the dry ingredients and pour the contents of the jug into it. Stir the wet and dry ingredients together until well combined then add the melted chocolate and stir again (I just use a balloon whisk for this- nothing electric is required as you don’t need to incorporate much air). Pour your just boiled water over the instant coffee granules and once they’ve dissolved, gradually add to the chocolate batter, stirring gently with your whisk as you go. The final cake batter will be very thin but don’t worry, it bakes beautifully. Split the mix evenly between the prepared tins and bake for 45-55 minutes (until a skewer comes out clean with a few moist crumbs attached). Once baked leave to cool completely in the tins. While the cakes are cooling make the ganache. Chop the chocolate into small pieces and place in a heatproof bowl. Heat the cream in a saucepan until it meets scalding point then pour over the chocolate. Allow the cream to melt the chocolate for a few minutes then stir until smooth and glossy. Add salt to taste then set aside to cool. For the coffee mascarpone crush the coffee into a fine powder then just whisk together all the ingredients until smooth. When all the elements are cool you’re ready to assemble the cake. Your cakes will probably have a domed top, so trim these off then divide each one into two even layers (leaving you with 4 layers overall). 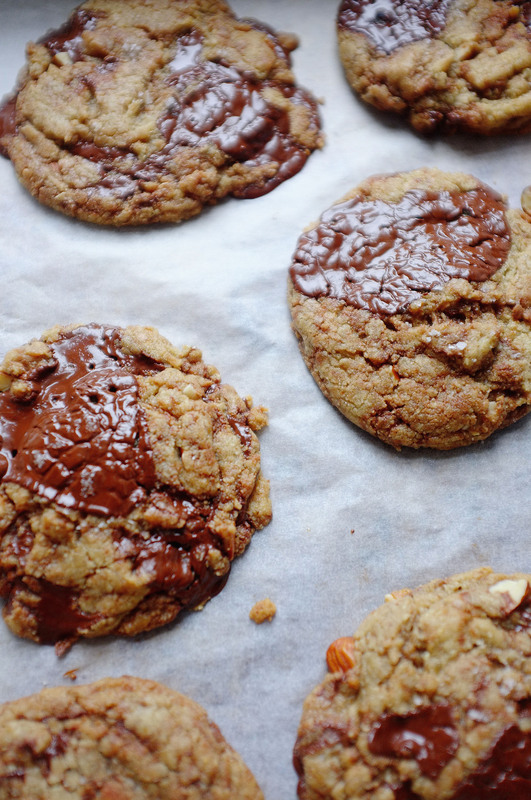 Scrape the hazelnut praline caramel into a piping bag. Split the mascarpone into thirds. Spread one third of the mascarpone over the first sponge layer then pipe over a third of the caramel in a zigzag (so that each slice will have some caramel inside!). 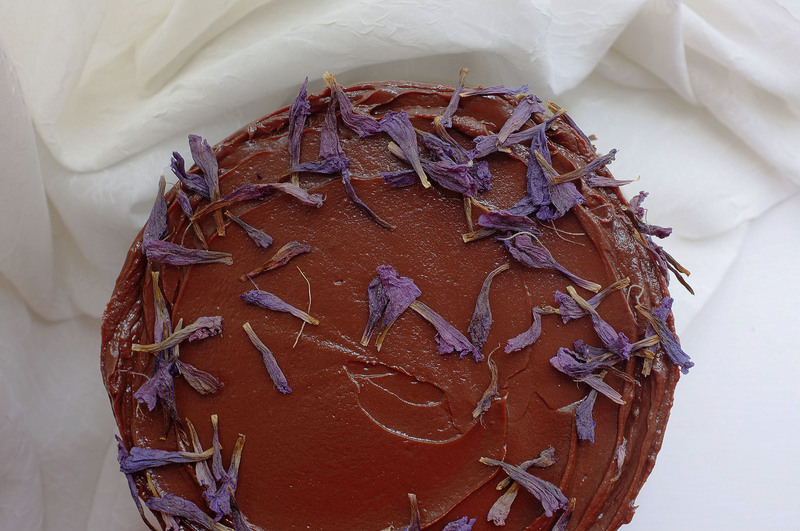 Repeat this step until you’ve used up the sponges, then rustically cover the whole cake in the thickened ganache. 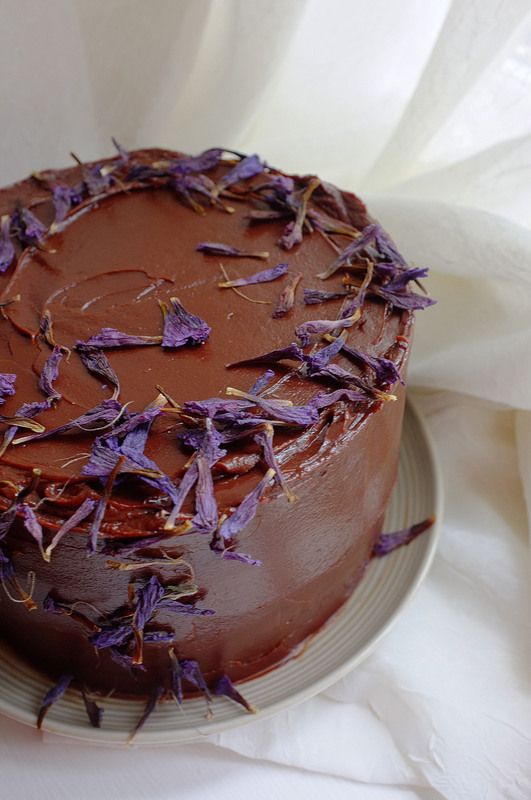 Garnish with edible dried flower petals. 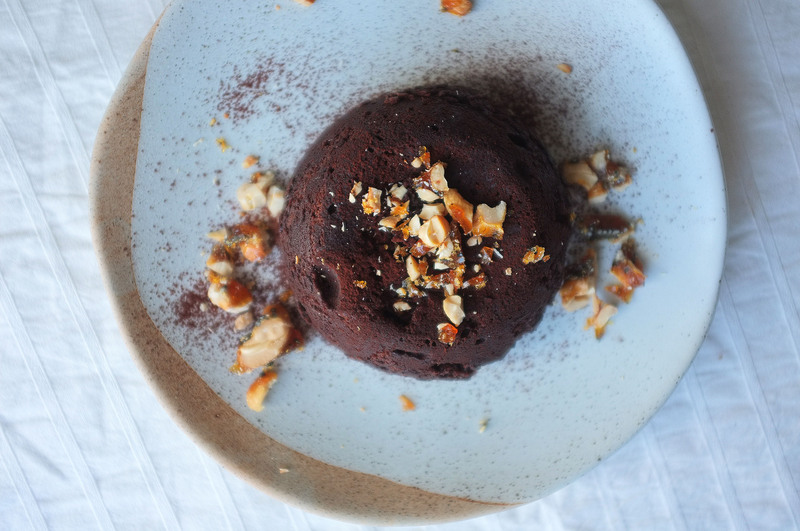 These little dessert pots are really easy to throw together and make for a great plant based alternative to a conventional dairy cheesecake. The combination of sweet filling, salty crumble and tart but slightly floral rhubarb is delicious, and I love the contrasting textures too. 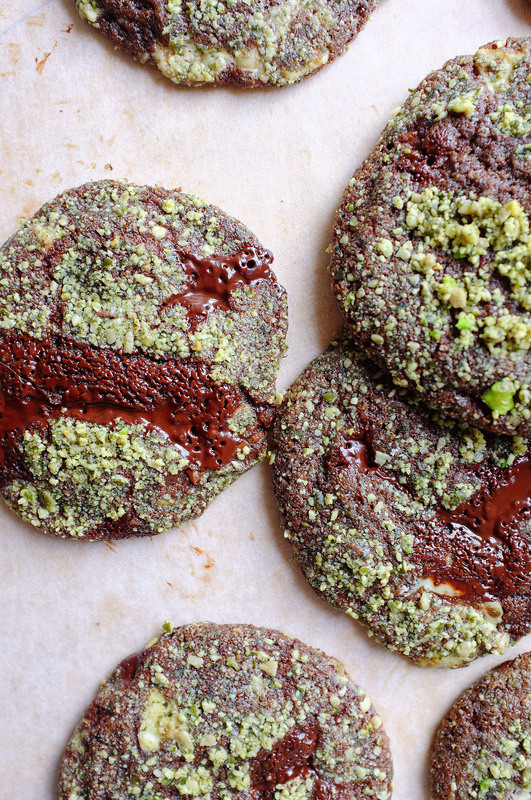 Give them a try, and don’t hold back on the halva. Preheat the oven to 180c. Line a baking tray with greaseproof paper. To make the crumble rub the coconut oil into the flours until the mix resembles coarse breadcrumbs, then stir through the sugar, salt and sesame seeds. Tip onto the prepared baking tray in one even layer and chill for 20 minutes (chilling will help keep any clumps of crumble together to create more texture once baked). Once chilled, bake the crumble for 15-20 minutes or until golden brown, turning occasionally. Set aside to crisp up while you prepare the other ingredients. 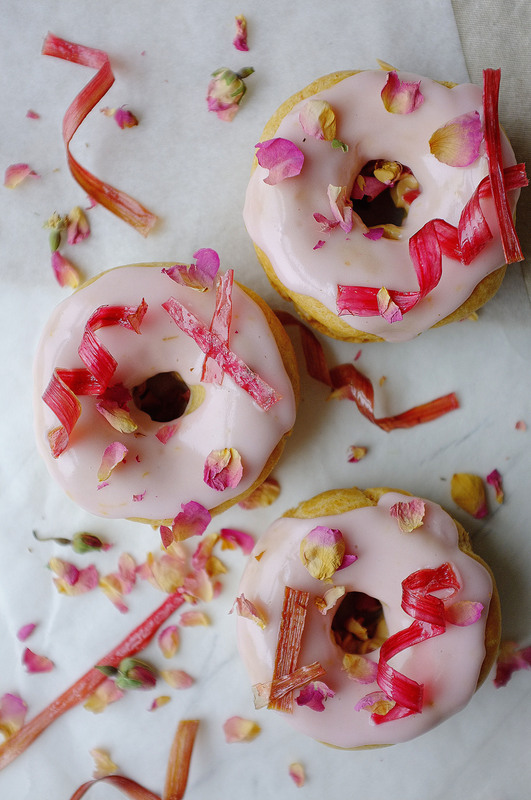 Slice the rhubarb into 2 inch batons and toss in the sugar and rose water. Line a high sided roasting tray with greaseproof paper and arrange the rhubarb pieces over the base in one layer. Roast for 15 minutes or until the rhubarb is tender but still holding its shape. Roughly shred half the rhubarb to form a compote consistency and leave the rest in whole pieces. Set aside to cool. While the rhubarb is roasting, make the ‘cheesecake’ mix. To do this simply whisk together the dairy free cream cheese, dairy free yoghurt, sugar and lemon zest until smooth (it will be looser in consistency than a classic dairy cheesecake, but the flavour is very similar and it works really well in a pot with the other ingredients). Chill. When all the elements are cool, you’re ready to assemble. Start off by distributing the shredded rhubarb between the pots to cover the bases. Now fill the pots to 3/4 full with the cheesecake mix. 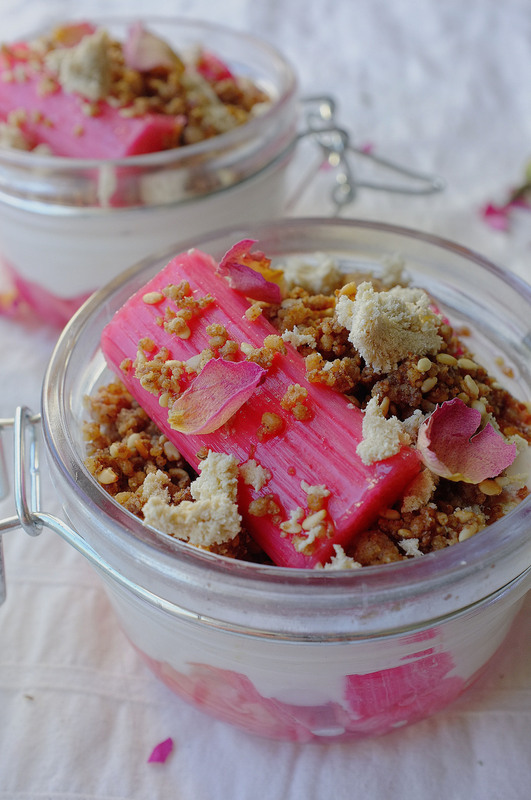 Add a generous spoonful of crumble on top, then a baton or two of rhubarb. 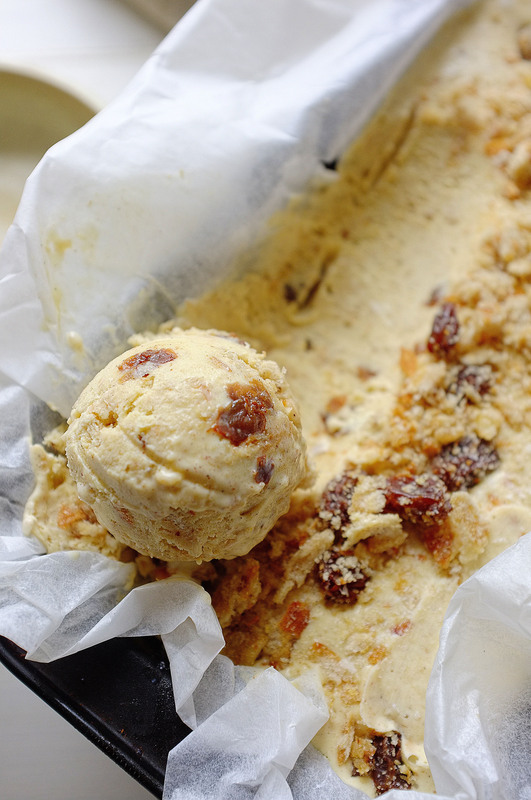 Finish with a good sprinkling of crumbled halva and garnish with rose petals, if you like. 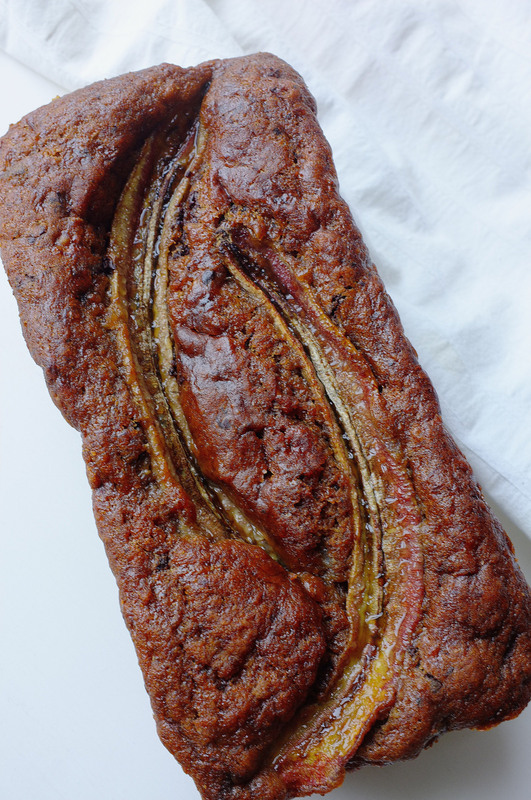 This vegan banana bread is perfect if you’re after maximum taste pay off in exchange for minimal effort; the method calls for just a mixing bowl and hand whisk and you’ll have it in the oven in less than 10 minutes. 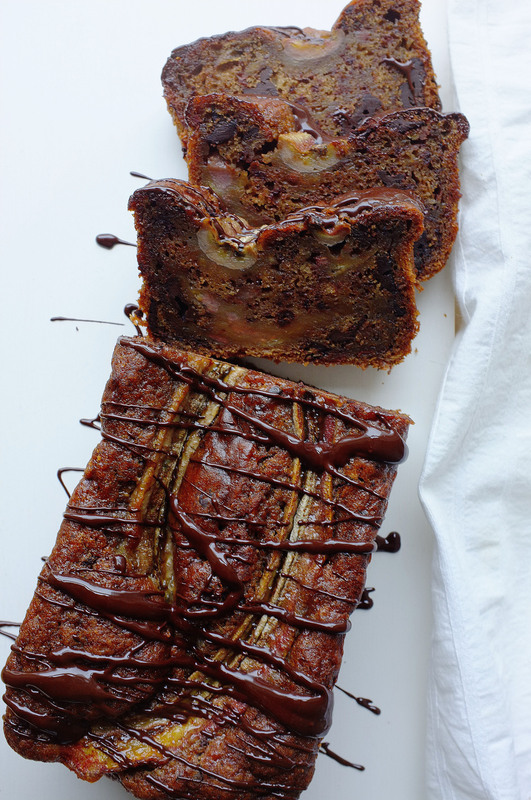 I add chunks of dark chocolate and a shot of espresso to my banana bread as it adds a great depth of flavour and slight bittersweet finish, but feel free to omit these (if you’re weird and don’t like my two favourite things). Preheat the oven to 180c. Line a large loaf tin with greaseproof paper. Place the oil, yoghurt, milk, mashed banana, both sugars and coffee in a bowl and whisk together. Now add in the flour, baking powder, bicarbonate of soda and salt and whisk again until you have a smooth batter. Roughly chop 100g of the dark chocolate and stir that in, reserving the rest. Scrape the batter into the prepared tin and arrange the banana halves on top. Bake for 50-55 minutes or until well risen, springy and golden. Once baked, leave to cool in the tin, then melt the remaining dark chocolate and drizzle over the top. In the spirit of Veganuary, I thought I’d keep my recipes plant based this month. I’m not vegan myself, but am completely on board with reducing my consumption of animal products, so should probably reflect this in my baking. This week I tackled a home baking classic: the chocolate chip cookie. I’m pretty smug about the result; you would never guess they contained neither eggs nor dairy as the texture is buttery and chewy and the flavour rich, nutty and indulgent. Definitely give them a try, I’ve had great feedback from my (very willing) testers! Place the coconut oil, almond butter, almond milk, both sugars and vanilla in a heatproof bowl and set over a pan of simmering water (ensuring that the water does not touch the base of the bowl). Heat, stirring occasionally, until all the ingredients have melted to form a smooth mixture. Set aside to cool for 10 minutes. In a large mixing bowl, stir together the rye flour, plain flour, bicarbonate of soda, baking powder and a pinch of salt. Add in the wet ingredients and mix with a wooden spoon until a soft dough has formed. Now evenly distribute 3/4 of the chocolate chunks and all the almonds through the dough. Chill for 30 minutes. Preheat the oven to 170c. Line 2 or 3 large baking trays with greaseproof paper. Using an ice cream scoop shape even balls of dough and arrange on the trays, allowing space for spreading ( I put up to 6 cookies on each tray). 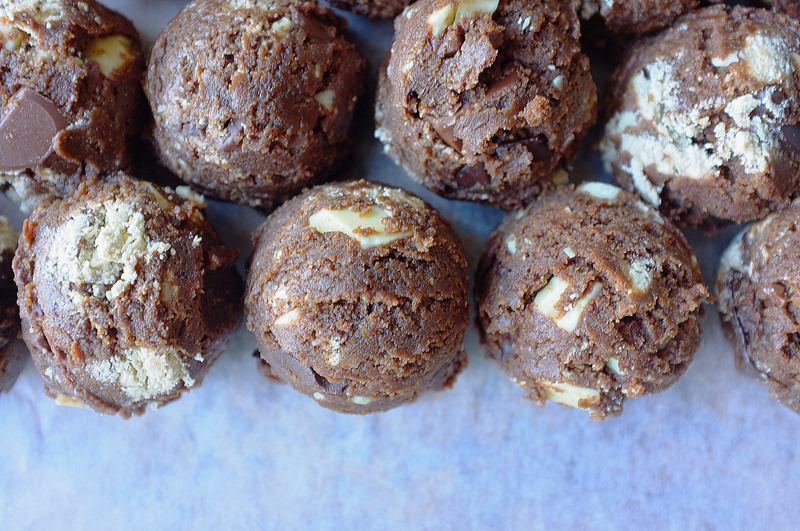 Take a couple of your reserved chocolate chunks and press into the top of each ball of dough, then sprinkle with some sea salt. Bake for 10 minutes, then carefully take the trays out and bang them sharply on a worktop. Pop them back in the oven for 3 minutes then repeat the bang technique before returning them to the oven for the final 3 minutes of baking. Once their time is up, bang once more and leave to cool. This technique is favoured by lots of bakers as it stops the cookies from puffing up too much and creates that wrinkly finish (you’ll probably need to bake the cookies in batches as this recipe will make 20-24). Leave the cookies to cool on the trays for at least half an hour before serving (unless you want a particularly warm and gooey cookie!). 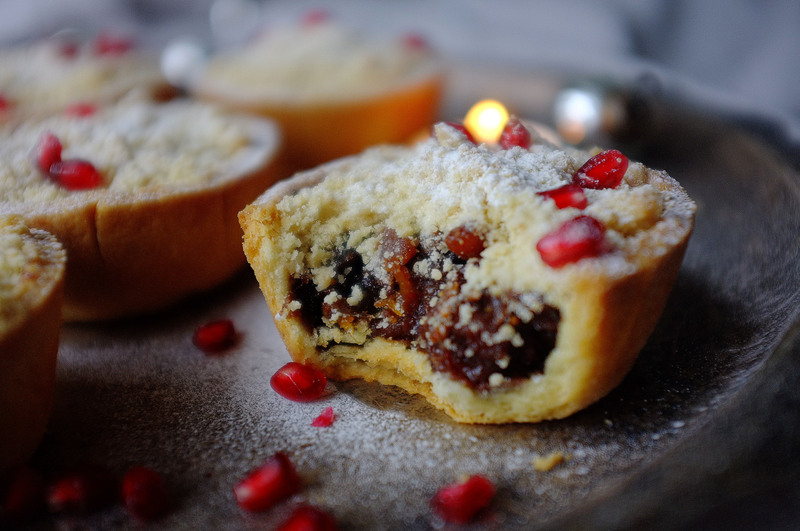 In the old school spirit of stir up Sunday I thought now might be a good time to share my favourite mincemeat recipe (it’s not compulsory to make this on 25th November though, it will work just as well after a few days of maturing!). 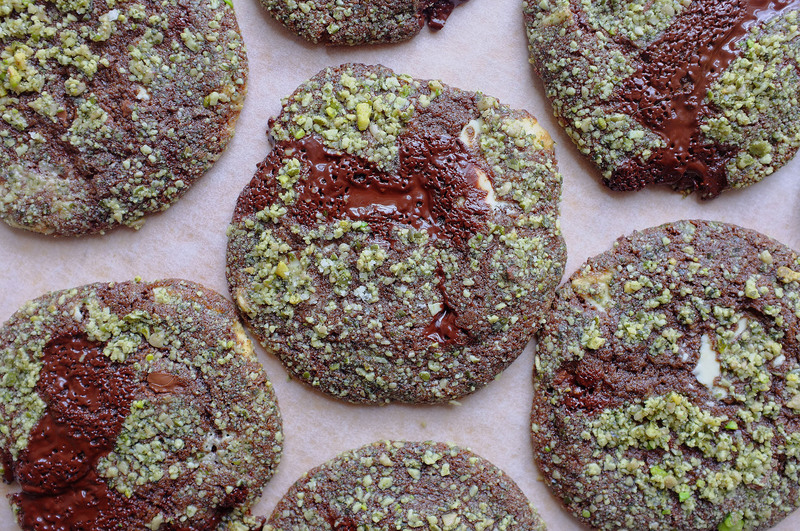 This is pretty classic in it’s foundations and I’ve been making it for a few years, but this year I’ve jazzed it up with some of my favourite Middle Eastern flavours (think pomegranate molasses, orange blossom, cardamom and pistachios). 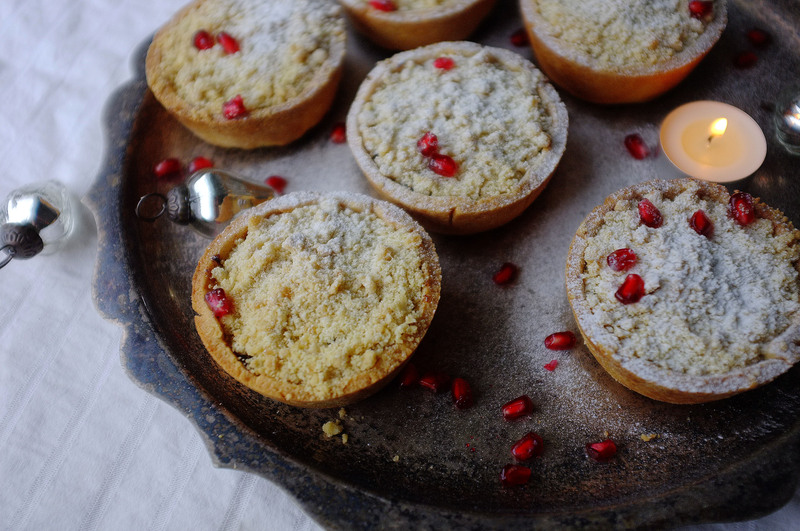 You could make traditional pastry-topped mince pies with this mincemeat, but I think it works really well with a tahini crumble topping- try it out! Ideally a week ahead of making the mince pies, make the mincemeat. To do this stir together all the ingredients except for the rum in a large bowl. Cover and leave the flavours to develop overnight. Preheat the oven to 120c. Tip the contents of the bowl into a deep roasting tray or oven-proof baking dish and cover with foil. Cook for 2 hours, turning gently every 45 minutes or so with a wooden spoon. Add in the rum and stir, then return to the oven, covered, for a further half an hour. Set the mincemeat aside and allow it to cool to room temperature, stirring a couple of times to keep everything well coated. Once the mincemeat has cooled down, store in well-sealed, sterilised jars. You can use the mincemeat at this stage, but if you can, leave it for a week or so for the flavours to intensify even more. When your mincemeat is ready to be used, make the pastry. Place the flour, butter, sugar and salt in a food processor and pulse until it resembles breadcrumbs. At this stage add the egg yolks and milk and pulse again until the mix comes together in large lumps (alternatively, rub the butter into the flour, salt and sugar using your fingertips then stir in the yolks and milk using a cutlery knife). Tip the dough out and shape into a disc using your hands. Wrap in cling film and chill for 10 minutes. For the tahini crumble rub the butter and flour together until they resemble rough breadcrumbs, then stir through the sugar, tahini and sesame seeds. Grease your cupcake tray generously with butter. 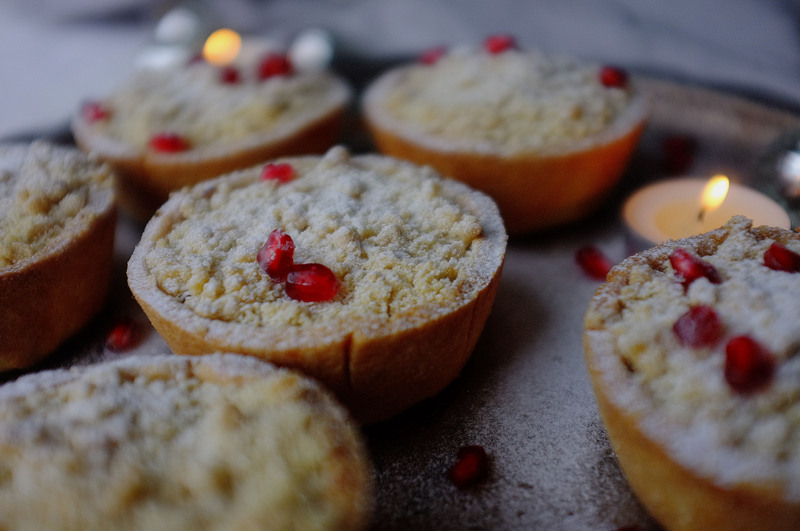 Roll the pastry out on a lightly floured surface to about 3mm thick and cut out circles to fit the cupcake holes (make sure your circles are big enough to create a deep mince pie- you want a generous amount of filling!). Push the pastry into the holes then fill with the mincemeat (in my large deep fill tray I put about 2 heaped tbsp of filling in each, but judge according to your tin). Top with a heaped tbsp of the crumble and bake for 20 minutes or until the pastry is golden and the crumble crisp. Enjoy hot from the oven with a dusting of icing sugar and dollop of cream or brandy butter. I’m under no illusion that this bake is a bit of a project and should probably come with a health warning, but I can honestly say that the the result it delivers is well worth the effort and extra 4539 calories (joking about the calories… although probably not far off). 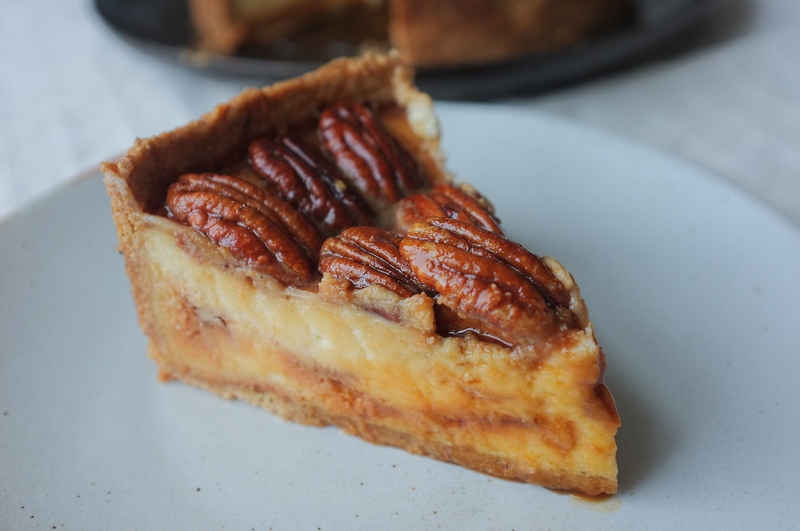 I’ve gone for a brown butter rye pastry in place of a biscuit base here, which might sound controversial (maverick), but it matches up to the nutty pecan topping really well and acts as a great textural contrast to the smooth, caramel-cored cheesecake filling. Give it a go, but be warned, it’s been described as ‘like crack’ by my eloquent taste-testers (who aren’t and never have been ‘on crack’, for the record). Start off by browning the butter for the pastry. To do this simply melt it in a pan until it’s gently foaming, smells nutty and is a light golden brown colour. At this stage pour the butter in a heatproof bowl and pop in the fridge or freezer to set hard. While the butter is firming up, make the caramel core. Place the sugar and water in a pan and gently heat until the sugar has completely dissolved and you are left with a clear syrup, then increase the heat and boil until it reaches a deep golden brown. Add in the cream (be careful as it will spit!) and stir for a further two minutes on the heat, then remove from the heat and add the salt and rum to taste. Set aside until needed. Back to the pastry; once your butter has firmed up, chop into cubes and tip into a food processor along with the flours, cinnamon and sugar. Pulse until it resembles breadcrumbs, then add in the milk and egg yolks. Pulse again a few times until the mix comes together in large lumps, then tip out onto your work surface and shape into a disc. Wrap in cling film and chill for 10 minutes. Preheat the oven to 180c. Grease a 2.5inch tall/ 8inch wide spring form cake tin with butter and place a disc of greaseproof paper in the base. Roll out the pastry to about 3mm thick on a floured work surface then line the prepared tin, pushing the pastry into the corners as you go (I actually find it easier to cut out a circle of pastry for the base and 2 long rectangles for the walls when I’m using a cake tin for pies and tarts- just make sure you blend the joins between the pieces together and don’t leave any gaps). Trim away any excess from the top of the tin, prick a fork all over the base (not all the way through) to prevent air bubbles, then chill for 10 minutes, or until very firm. If you like you can cut out some leaves for decoration at this stage. Once firm, line the pastry case with baking paper and fill with baking beans (ensuring that they come all the way to the top of the walls), then blind bake for about 15 minutes, or until the walls are supporting themselves. At this stage, remove the paper and beans and return to the oven for another 10-15 minutes, or until the pastry is cooked through and golden. Set aside. Reduce the oven temperature to 120c. For the cheesecake filling simply whisk together the cream cheese, sugar and corn flour until smooth, then add in the eggs one at a time, beating well between each addition. Lastly, whisk in the soured cream and salt. Tip half of this mixture into the pastry case then drizzle over the caramel. Top with the remaining cheesecake mix (this should come to about an inch below the rim of the pastry case). Bake for 50-55 minutes, or until the middle retains a little wobble. Set aside and allow to settle and cool down slightly. Increase the oven temperature to 170c. 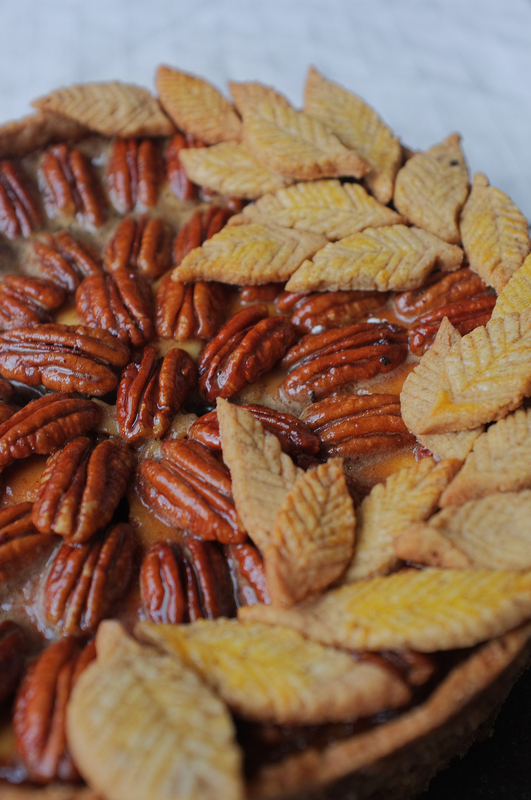 While the cheesecake is baking, mix together all the topping ingredients, except the pecans,until smooth. 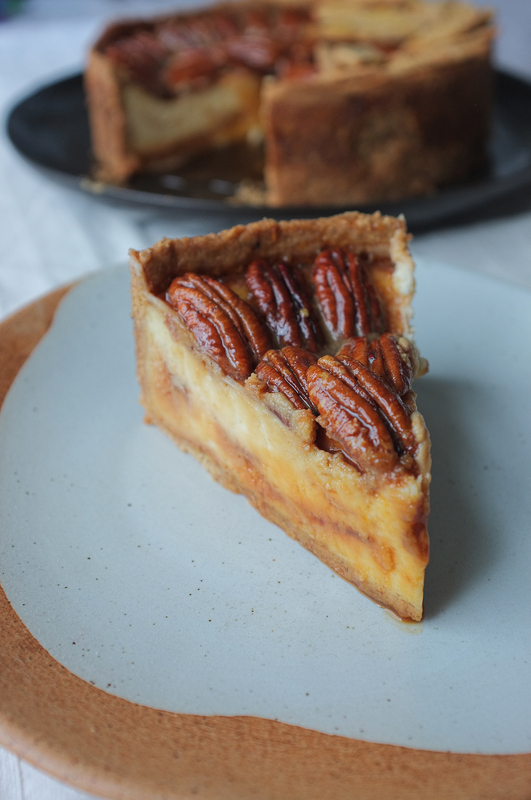 Once your cheesecake has cooled to a point where it’s no longer hot to the touch, arrange the pecan halves across the surface, then pour over the syrupy mixture. Return to the oven for 10-15 minutes until the topping has thickened slightly. Set aside to cool then chill to set up for at least 4 hours (ideally overnight). When you’re ready to serve, run a knife around the edge of the tin and gently release the cheesecake, then slice up and enjoy! 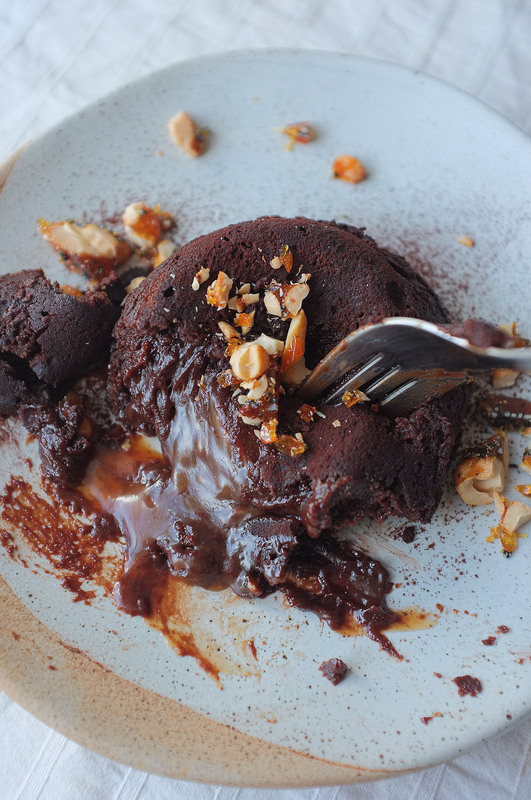 A classic, but better; think filthy dark chocolate fondant with an oozing liquid centre, then throw in the addition of pooling, hot, slightly-savoury miso caramel sauce and a salted, nutty crunch topping. Need I say more? 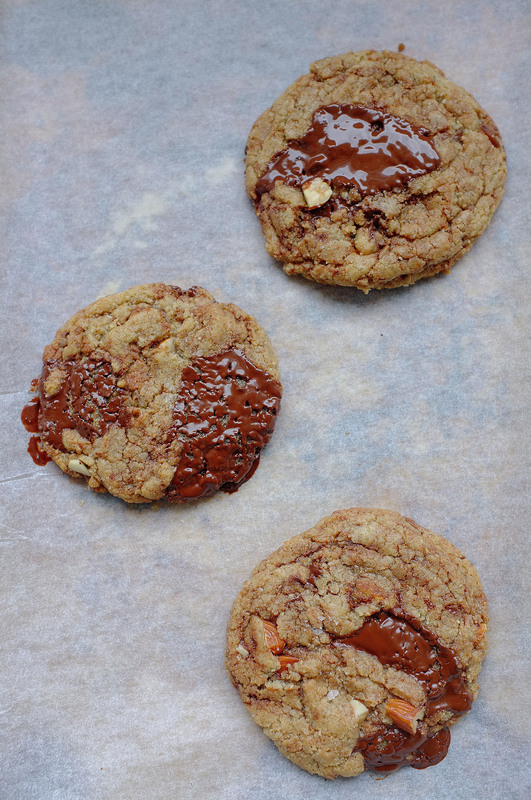 Before you make the chocolate mix, make the miso caramel. To do this place the sugar and water in a saucepan and heat gently until the sugar has completely dissolved, then increase the heat and boil until it reaches a deep golden colour. At this stage, add the double cream and stir for another minute before taking the saucepan off the heat and adding the miso paste and salt. Stir until smooth, taste and adjust the level of salt then pour into a heatproof tub and chill until firm. For the salted cashew crunch place the sugar in a pan and melt, then allow it to turn golden brown and add the cashews, sesame seeds and salt. Stir to coat the cashews with the caramel then tip onto a piece of greaseproof paper and leave to set hard, then roughly chop into a coarse crumb. Preheat the oven to 180c. Grease the insides of the fondant moulds with the extra butter, then dust with cocoa, shaking to coat. Tip out any excess then place all the moulds on a baking tray, ready to be filled. For the chocolate mix, place the chocolate and butter in a large heatproof bowl set over a pan of simmering water. Stir occasionally until smooth then set aside to cool a little. Whisk in the sugar (using a good old fashioned hand whisk will do) then the eggs, one at a time. Fold in the flour and once you’ve got a smooth mix split half of it between the moulds. 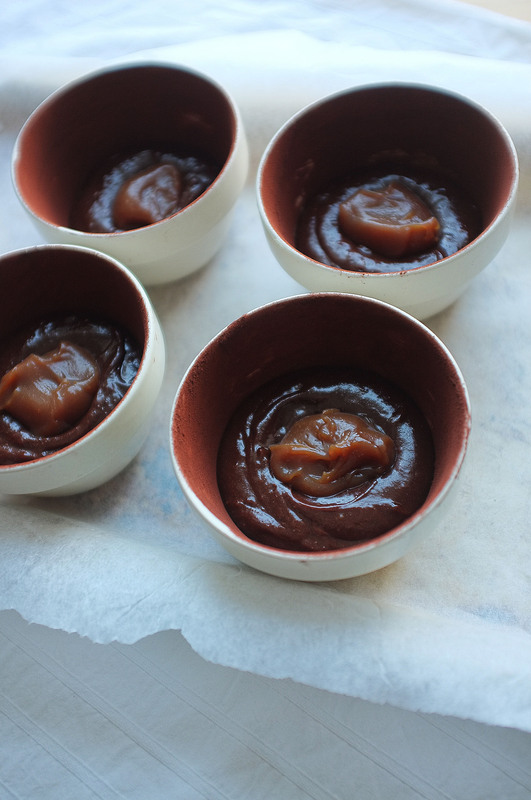 Now create a little indent in the middle of the chocolate in each mould and scrape in a heaped tablespoon of your caramel. 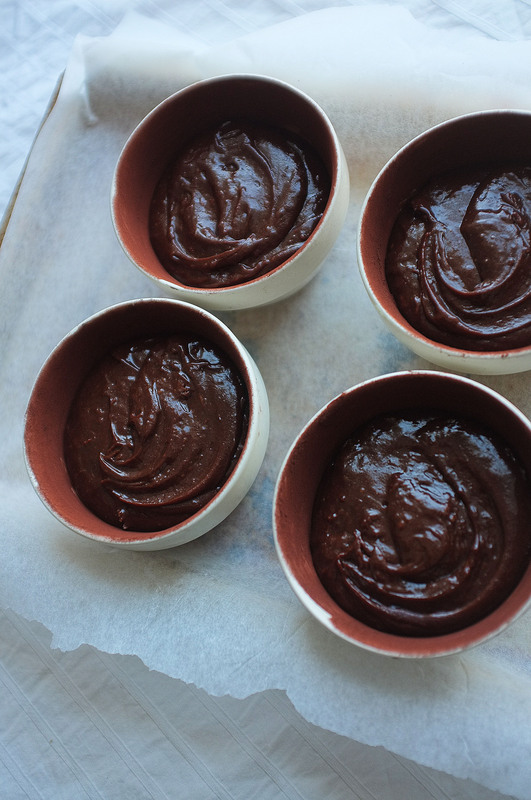 Top up with the remaining chocolate mix until each mould is filled to about 2cm below the rim. Bake the fondants for 17-22 minutes or until they are set on top and around the sides but still have a slight wobble in the middle (this time will vary from oven to oven and mould to mould so keep an eye on them- bare in mind my moulds have a 2inch wide base/3 inch wide rim/are 2 inches in height, and the fondants took 22 minutes in my old school oven!). Once the fondants are ready, leave to sit for a minute or two then run a knife around the edge of each mould. Carefully turn the fondants out onto serving plates and sprinkle with some salted cashew crunch. 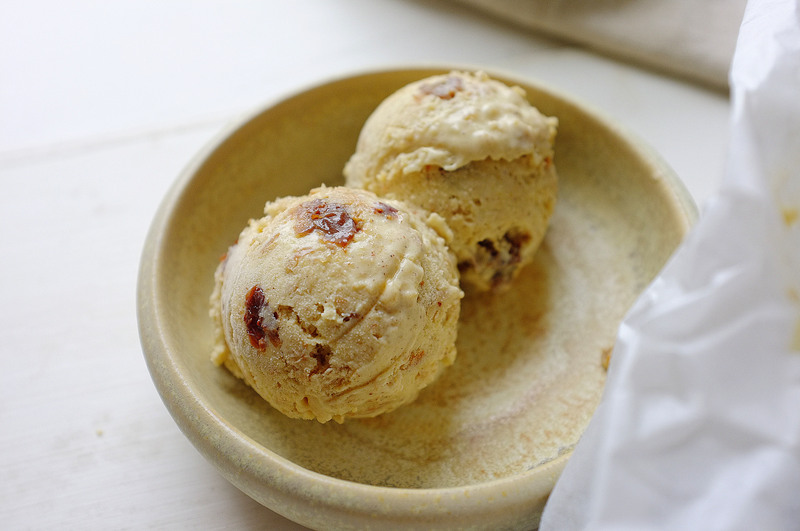 Serve with vanilla ice cream for added indulgence.